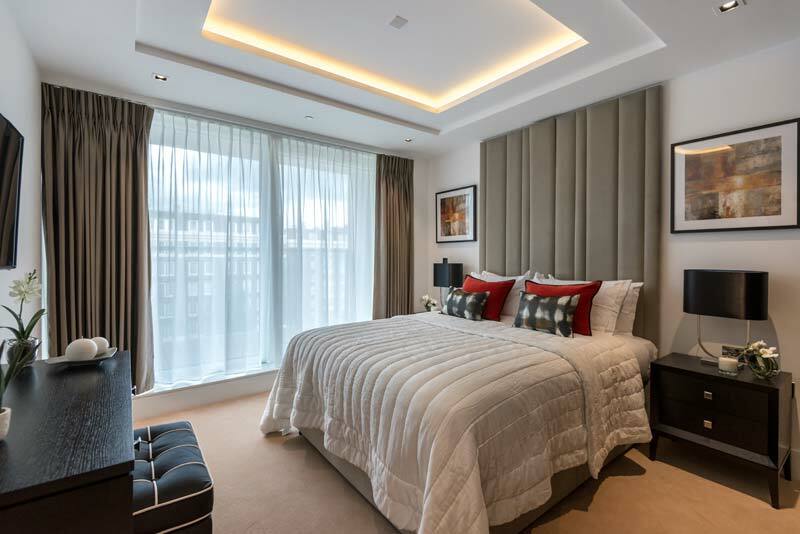 The team at ani M INTERIORS was delighted to influence the décor of this two-bedroom, purpose-built apartment in Kensington High Street. The client felt that this high-end property would benefit from an interior designer’s keen eye and insider knowledge of the best furnishings. 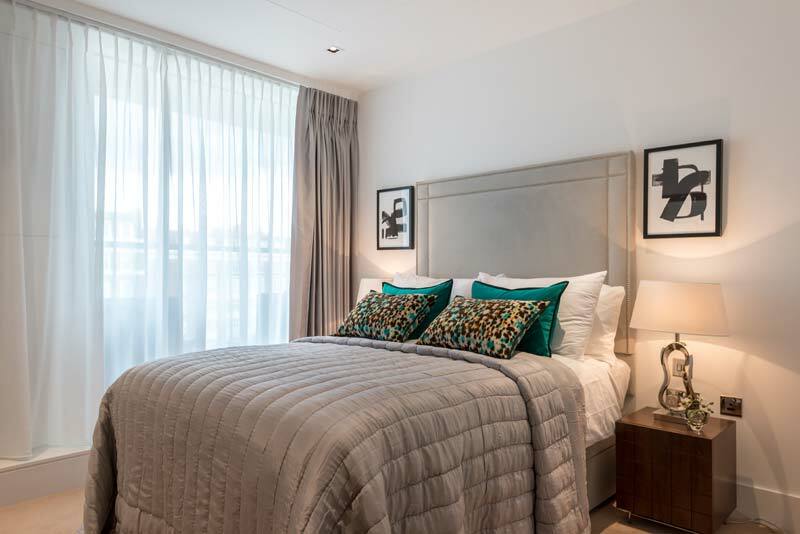 The development is from the prestigious Berkeley Group and located in one of the designer shopping hotspots so the team knew that nothing short of the best would do. The brief was to replicate the overall feel of the show apartment that the client had viewed and showcase the client’s own personal tastes. A colour palette of grey tones in different textures and finishes was chosen throughout to add depth and sophistication. Bespoke upholstery complemented the team’s selected furniture from preferred suppliers to complete the look. The open-plan kitchen, dining area and living room is dominated by a rich, velvet,L-shaped sofa. Scatter cushions encourage the visitor to relax and sink into its plush grey folds and unwind. The complementary occasional chair upholstered in a shimmering fabric helps to lend an informal feel. Clever details bring the interior to life. 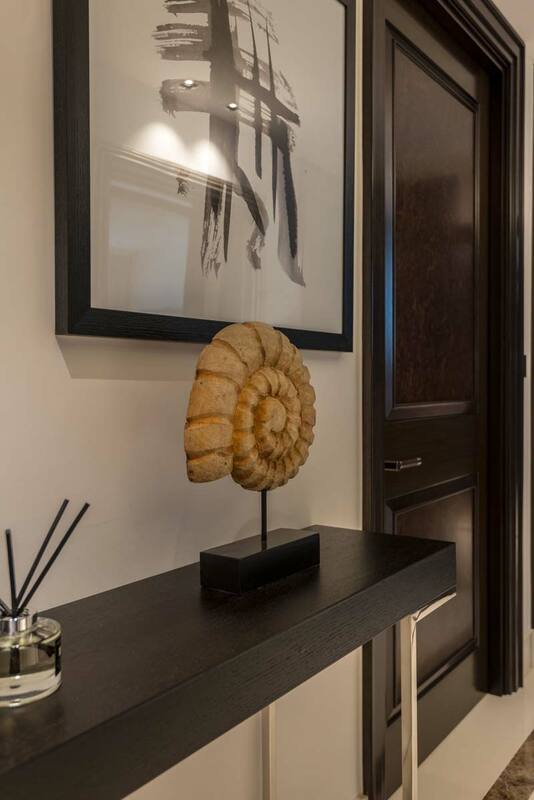 For example, the scalloped edges of the large, circular mirror in the living area are echoed by a beautiful, circular fossil ornament in the hallway to create a harmonious space. The show-stopping element of the room however, is the marble fireplace. 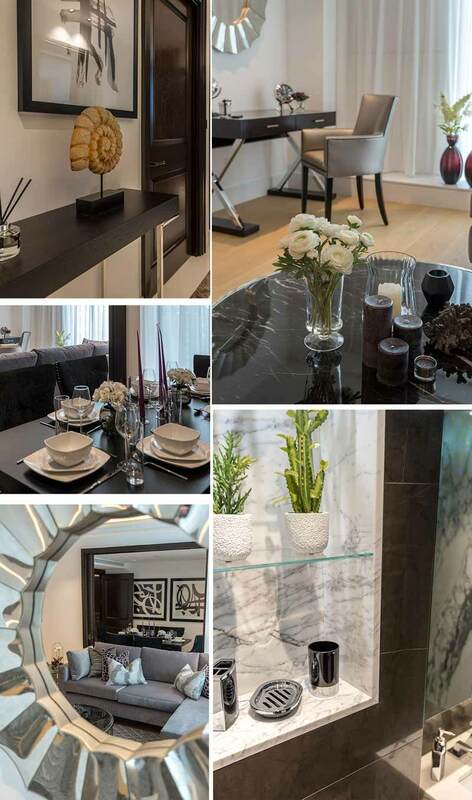 So the team chose marble-toped coffee and side tables to continue this high-end look. 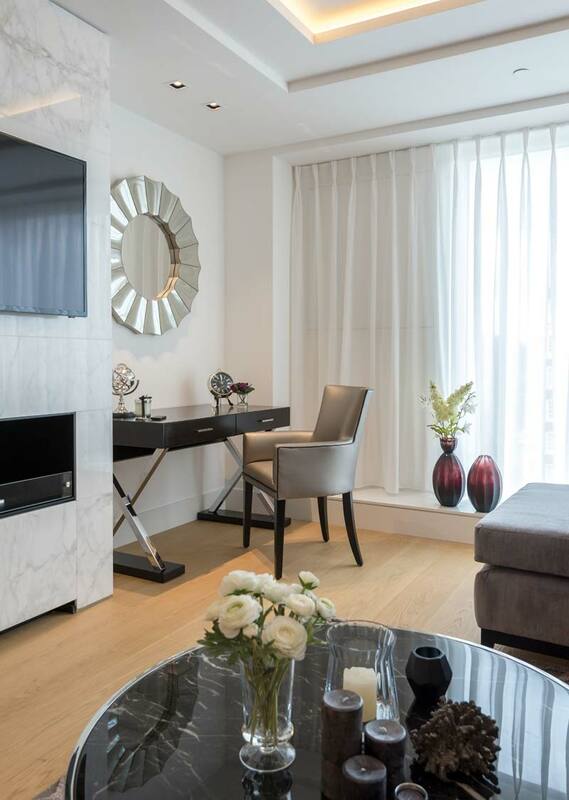 This property serves as a holiday home for the client so what better way to make a stay there feel special than to recreate the look and feel of a luxury hotel suite? For this reason, in the master bedroom, the designers made an incredible floor-to-ceiling headboard the focal point. Warm shades of taupe and burnt orange make the room feel calm and inviting while the dark wood furniture adds richness and depth. The finishing touch was to make the client feel that this room is their own private sanctuary. Sheer curtains bring privacy and obscure the view of the busy London streets below. In the slightly smaller second bedroom, a cool and tranquil colour scheme of blue and grey is complemented by the same rich wood tones. The scale of the room drew on the design team’s skill. Everything had to be slightly smaller to ensure that the room doesn’t appear overcrowded. Compact furniture and a reduced-size headboard create the affect of a much larger, grander bedroom. The same beautiful sheer curtains help the guest feel calm and rested, as though the hustle and bustle of the capital is far away. 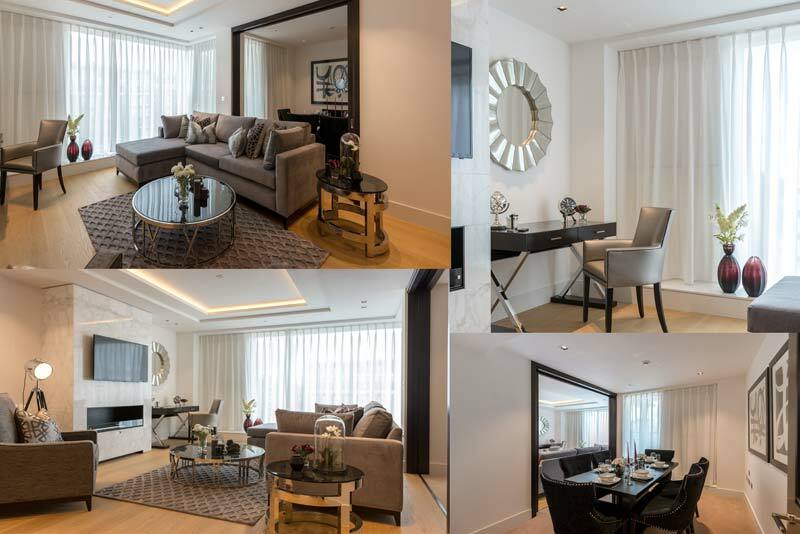 The client was delighted, especially as they travel a great deal this apartment feels like a luxurious break from a whistle-stop tour. Even though it overlooks London’s shopping hub, with its chatter of visitors and buzz of traffic, it feels like an oasis of calm. To see how your property can be transformed into a haven, contact the team who will be happy to help you realise your dreams.